I can't remember if I knew if the hospital was in Portland, Oregon, but that's interesting. Not as interesting as the remote medicine found in "One Fine Day," but still different. I found that episode significantly better than the one that followed it, "Truth or Consequence." In the first, we saw three very dangerous cases, and I'm glad it wasn't a happily-ever-after for all, as that would have been implausible. I also found the final scene in that episode very telling... Napur looking at Wilson looking at Ridgeway looking at baby Chloe. Obviously, that choice was made so viewers could learn Ridgeway's desire to be a mother, and the timing couldn't be worse - just after she's served with divorce papers. The second episode made me almost wish I had stopped watching this show again... I didn't care about Delaney - we had hardly met him. We all know Park needs to work on his bedside manner, but the "English lessons" on the computer were annoying. The jumper-turned-victim was fairly intriguing, but I felt that particular storyline was dragged out. Also, although I found the non-medical stuff with the deposition to be different, I don't want to watch a segment about it every single episode until it's resolved. How is everyone else feeling about this series? Monday Mornings "One Fine Day" (S01E07): Wilson and Ridgeway were being intimate when his computer goes off and they have to help a field medic in Afghanistan who has very little to work with. [fascinating! I didn't realize military doctors consulted like this!] 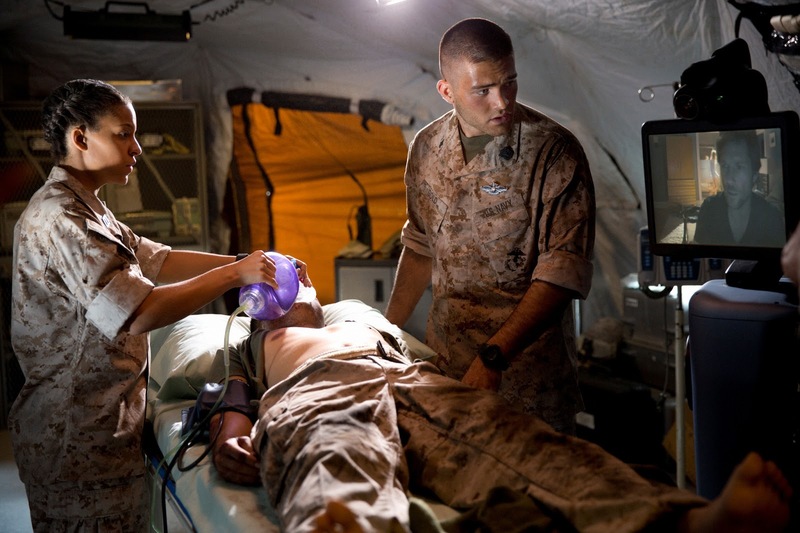 See, Wilson freelances some military medicine, thanks to robotic technology, among other things. The situation is serious and Wilson must walk the twenty-year-old medic through a craniotomy. [I had a rough time looking at all those holes!] Wilson is called into the M&M over his robot, and Hooten questions whether dating a colleague would compromise a doctor's work. He also gets into trouble for not following up - but the patient is doing fine. Napur sees a ten-week-old infant who constantly laughs, and it turns out to be a brain tumor that was causing seizures. [awwww!] Operating is very risky on a child this young, but they can't wait because it could be affecting development. As soon as Wilson gets into the hospital, he's put on this operation, which is successful and little Chloe will only need to stay a few days in the hospital as a precaution. Monday Mornings "Truth or Consequence" (S01E08): Starting in an M&M where a patient died after initially just having scar tissue on her ear because of a small dog bite. The patient received a lethal dose of pure epinephrine due a mix-up. However, although it was the fault of a nurse, all negligence falls to the surgeon (Delaney) in the OR. Hooten fires the guy, but Buck and Robidaux question that choice.